All that stands between them and the unknown is a red door. It is the sole entry point to a house isolated in in the wilderness, presided over by a man obligated to protect his family with obsessive conviction. What he – and therefore the others – fear beyond the boarded windows is referenced in whispers but never certainties, creating ambiguity when the narrative restricts their movements to a small space beyond the danger. Then, just as they lay to rest their grandfather after he contracts what appears to be a contagious disease, a stranger emerges in the darkness. Who is he? What is his agenda? How did he find their home, so far off the beaten path? A stand-off ensues, leading to an unnerving test that might reveal a critical detail – namely whether he, too, is afflicted with the sickness they dread. 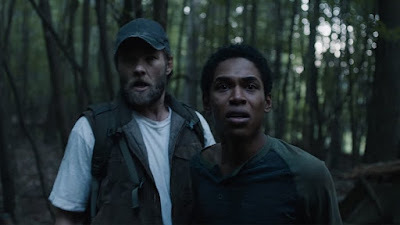 “It Comes at Night,” one of the more profound of recent horror films, contemplates a conclusion only out of necessity; it is about how fears blind us to the truth, the lengths we go to protect those we love and how compassion becomes lost when the horrors of a silent world lead us astray from the value of human grace. One of the most exhausted devices of supernatural horror is a creepy-looking doll with murderous tendencies wreaking havoc on its owners. Long before Chucky there was a homicidal clown in “Poltergeist,” and before that was Talking Tina, one of the prominent menaces of “The Twilight Zone” – their commonality was that the victims always were oblivious to dangers until far too late, perhaps because no one involved could really believe a small toy had the capability of causing great harm to others. 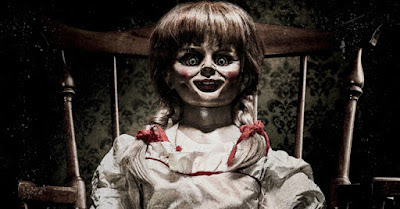 That is the first mistake of the characters in “Annabelle,” who are given enough warning signs to facilitate the dread: the emphasized arrival of said doll, its strange facial expression, an ambush by satanic cultists who die with it in their possession (one of them bleeds into the doll’s eyes), creepy noises from around corners, and rocking chairs that come alive by themselves even when no one is nearby. Then there is a moment where the husband, granting suspicion to his paranoid wife, throws the doll away in a garbage can. Shouldn’t it amount to something startling, then, when it then appears packed away in a box, as if no such decision transpired? If there were a persistent sentiment amongst the demonic spirits that inhabit them, it’s that you always have a chance to endure if you find yourself in the home of flyweight suburbanites with only a dozen functioning brain cells between them.